Chino Hills Traffic Signal Master Plan & Traffic Operations Center Design – Advantec Consulting Engineers, Inc.
ADVANTEC prepared the design of the City’s new Traffic Operations Center (TOC) that will provide centralized control of the City’s entire traffic signal system. We also performed the communications interconnect design for all traffic signals along the City’s four major arterial corridors. 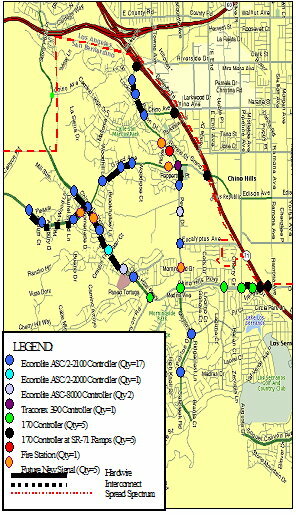 Additionally, ADVANTEC provided CMAQ project guidance and assisted City with Caltrans procedures and forms; evaluated and inventoried the existing traffic signal system; prepared traffic signal plans for 32 intersections; identified area of deficiencies at each intersection; made improvement recommendation; and prepared final master plan report. ADVANTEC conducted A.M. and P.M. turning movement counts at all major intersections and used SYNCHRO to generate new signal timing plans for implementation. We did a cost analysis of all communications technologies to determine the most cost effective and reliable means to provide interconnect of the traffic signal system. As part of the TOC design, we prepared specifications for video switching equipment, operator workstations and printers, equipment cabinets, power supplies, video wall display, system server, system software applications, TOC furnishings and operator’s consoles, WWV clock, and Master controller.